Neill is dedicated to sourcing the most beautiful, the most rare, the most extraordinary flowers for his Belgravia boutique and his concession at Harrods where his clientele are eager to see and learn about new, unusual or simply exquisite blooms. In this blog post he shares the fabulous experiences he enjoys while sourcing these flowers in Holland. One of the many aspects of my job that I absolutely adore is my sourcing trips to Holland. And of the many I make during the year, the one in Spring time, when the bulb fields are in bloom and the world-famous Keukenhof Gardens are open, is my favourite of all. Which is why, in this blog post, I would like to share with you images of the incredible scenery and views I experience during my visits because they are so inspiring. The bulb fields are not far from the Keukenhof Gardens, and a visit to this estate is a must for any flower lover. Here are just a few images of the 7 million spring flowers created by 100 royal suppliers showcasing their very best bulbs in a landscaped garden which covers the 200 hectare estate. This year the gardens are open from 22nd March until the 13th May just in case you can plan a visit! There are fabulous Vanda Orchids in bloom all year round. The massive size of this Vanda grower's glasshouse, the intense colour and the elegance of these flowers always impress me. Also all year round, thousands of magnificent Phalaenopsis Orchids in many, many different colours grow profusely in this glasshouse making the site quite breathtaking. 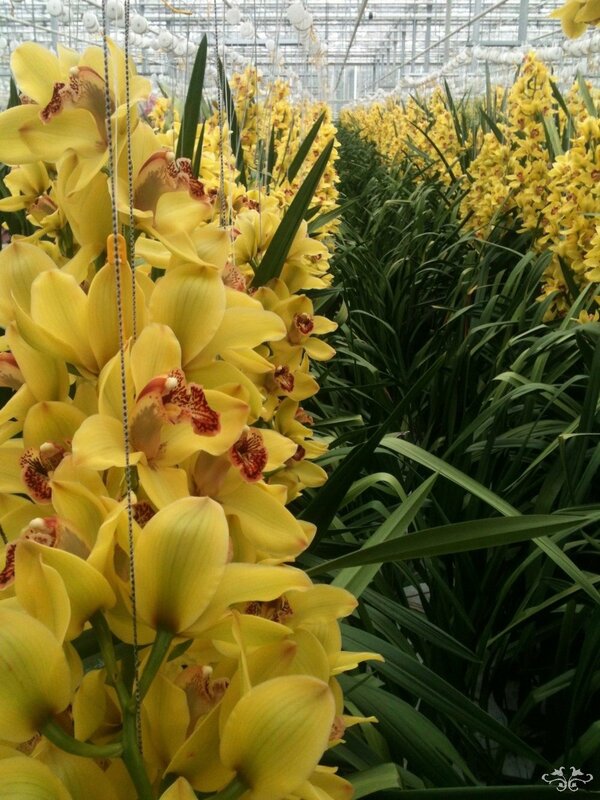 These magnificent plants are trailing Cymbidiums at a specialised grower. Exquisitely elegant. Strikingly tall Cymbidiums growing at another Cymbidium grower. Acres and acres of Avalanche Roses: Sweet Avalanche, Pearl Avalanche and white Avalanche. 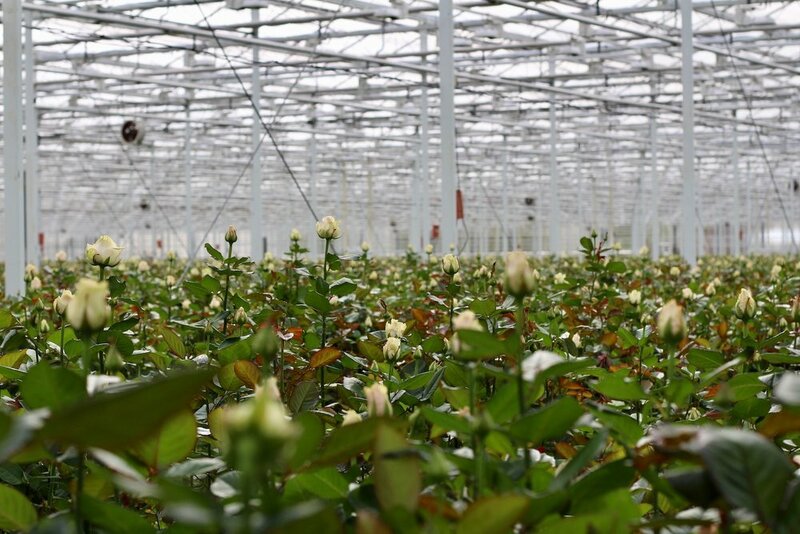 This amazing grower produces the finest Avalanche Roses and picks its very best 80 and 90 cm Roses especially for us. Red Naomi Roses growing at our favourite red Rose supplier. Hydrangeas grow here til the eye can see enjoying the sunshine in late spring. These are the most striking Hydrangeas in Holland and the only grower with a technique to have Hydrangeas in bloom almost 10 months a year. 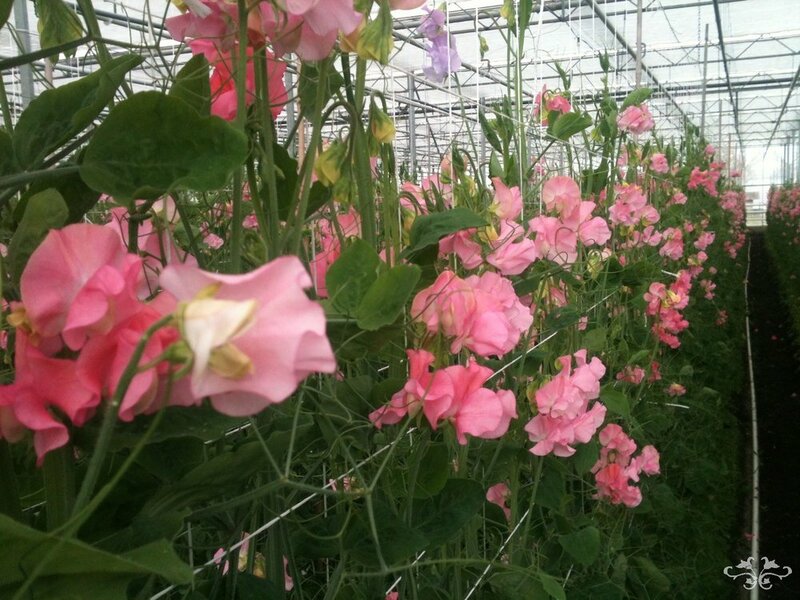 Our Sweet Pea grower has also been working on how to extend the seasonality of his blooms and now his divinely scented flowers bloom in the spring until autumn and we are able to offer these beauties to our clients as early as April. I also like to visit some of our plant and succulent growers and enjoy the oasis of soothing green at these glasshouses. So many stunning scenes of beautiful blooms... So many people and families that dedicate their lives to creating these incredible flowers. I always feel privileged to be able to visit them and to sell their blooms to people who really appreciate the results of their hard work. I hope you have enjoyed these images - and now you can come and see the flowers and the designs we have made with them at our Belgravia boutique and our concession at Harrods. We look forward to seeing you.